The building on the corner of Bore Street and Breadmarket Street occupies a highly visible location, and for many generations of people living in Lichfield it has been known as the Co-op until the 1980s, and then as Burtons up to five years ago. 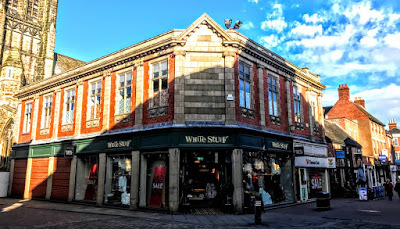 Today, this prominent retail site is home to WhiteStuff and Thomas Cook the travel agency is on part of the premises at No 43 Bore Street. It is more than a matter of curiosity that this group of retail premises, opposite the Guildhall, is known as ‘The Cloisters,’ for not only is it beneath tower of Saint Mary’s Church, but this was once the site of the earliest Roman Catholic Church in Lichfield, albeit for a brief few years over 200 years ago, at the beginning of the 19th century. Lichfield had a strong Roman Catholic presence that dates back to the days of the theological debates, controversies and conflicts at the Reformation. The large number of clergy at Lichfield Cathedral clergy who were deprived along with the Bishop of Lichfield, Ralph Baynes, in 1559 or soon afterwards included the Precentor of Lichfield, Canon Henry Comberford, as well as the Dean, John Ramridge, and the Chancellor, Alban Longdale, and the Treasurer, George Lee, was forced to resign in 1560. There is evidence of a continuing Catholic presence almost a generation later in 1582. 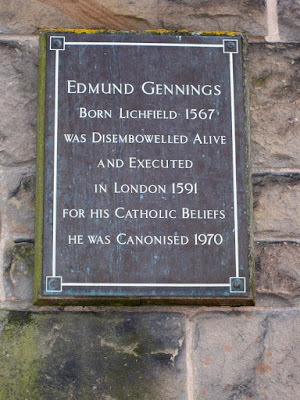 The Roman Catholic martyrs in the Elizabethan era included Saint Edmund Gennings (1567-1591), who was born in Lichfield in 1567. He was ordained in Rheims in 1590 and returned to Lichfield. He was captured in London and executed on 10 December 1591. 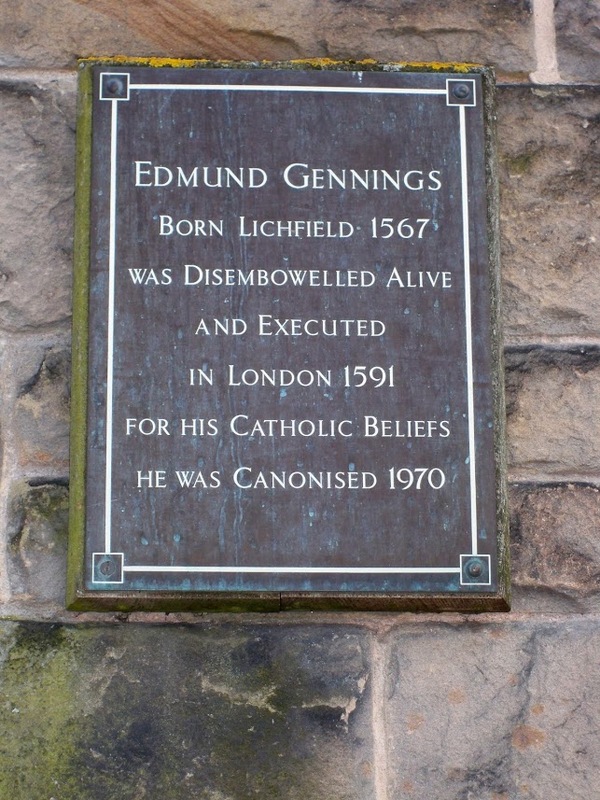 He was canonised as one of the Forty Martyrs of England and Wales in 1970, and is named on one of the plaques on the side of Saint Mary’s remembering the Martyrs of Lichfield. Later, a Puritan survey in 1604 found ‘many popish’ in Lichfield. This Roman Catholic presence continued in the Lichfield area in the 18th century. A census of recusants in Staffordshire in 1706 returned 1,200 people, including Mrs Comberford of Comberford, her three grandchildren and her three servants [Greenslade, p p 181]. Greenslade suggests the private chapel in Comberford Hall probably continued into the early decades of that century, and Pipe Hall, once the home of Heveningham family who had intermarried with the Comberford family, was a Roman Catholic centre with a chapel. But the chapel at Pipe Hall closed when Thomas Weld, a descendant of the Heveningham family, sold the house in 1800. Weld gave the vestments and other items belonging to the chapel and £200 to Thomas Clifford of Tixall. Clifford raised a further £400 and bought a house on the corner of Bore Street and Breadmarket Street, then occupied by a Roman Catholic baker. This corner house provided lodgings for a priest, and a chapel was formed by throwing two rooms together. Father John Kirk (1760-1851), who had been the priest at Pipe Hall from 1788 to 1792, and in 1801 he was appointed to Lichfield by Bishop Gregory Stapleton, the newly-appointed Vicar Apostolic of the Midland District. Father Kirk was the last student received by the Jesuits into the English College in Rome before Pope Clement XIV suppressed the Society of Jesus in 1773. When he was appointed to Lichfield in 1801, he had a stipend of £60 a year. At the beginning of the Lichfield mission, there were 60 adult communicants, and later, by 1810, there were 75, including Catholics from the Tamworth area and French émigrés and prisoners of war. Meanwhile, however, Father Kirk found the house on the corner of Bore Street and Breadmarket Street was inconvenient and ‘meanly situated.’ He complained that the sanctuary of his chapel was directly over the baker’s oven, and that the heat was almost unbearable. In 1802, he bought land in Upper Saint John Street and there he built a chapel and house that were completed in 1803. The chapel was first dedicated to Saint Peter and Saint Paul. The name was changed to Holy Cross Church when the church was enlarged in 1834, including the addition of a turret and an entrance porch designed by the Lichfield architect Joseph Potter. A painting of the Crucifixion by the 17th century Flemish artist Nicolaes de Bruyn, brought from Pipe Hall, had served as an altarpiece, and was also moved from the Bore Street chapel to the new chapel on Upper Saint John Street. When Father Kirk died on 21 December 1851, aged 91, he was buried in the chapel he had built. He was succeeded by Father Joseph Parkes, his assistant for 10 years. Meanwhile, what happened to the baker’s shop on the corner of Bore Street and Breadmarket Street, and the chapel above it? In his book, The Old Pubs of Lichfield, John Shaw says the Dolphin is first listed on these premises 200 years ago, in 1818. However, Kate Gomez on her local history blog, Lichfield Lore, has pointed out that the original building on this corner site was timber framed, dating back to the 16th century, and she wonders whether parts of the original building survived in the changes over the centuries. In 1818, the Dolphin was run by Henry Genders, who later ran athe Board, a pub on Birmingham Road. Standing opposite, on the other corner of Bore Street and Breadmarket Street, was the Goat’s Head, which survived until 1970. By 1896, the place was known as the Dolphin Hotel. The last known licensee was Percy Woodfield, who later moved to the Lemon Tree at 125 Beacon Street, which closed in 1915. The Dolphin Inn was demolished in 1912 and replaced by the current building in 1913. It was built by local builders JR Deacon as the Walsall and District Co-operative Society Ltd Branch No 13. Kate Gomez notes that when the new Co-op opened, the builder, Councillor Deacon, handed the chairman of the Co-op with a walking stick made from one of the wooden beams of the old Dolphin Inn. She suggests the possibility that the previous building not fully demolished, and may just have been significantly altered and incorporated into the present building. In my imagination, I wonder whether it was similar in building style to the 16th century timber framed building next door to Thomas Cook’s that is now Caffe Nero. In her blog Lichfield Lore, Kate Gomez reported five years ago [11 May 2013] that Frank Clarke, a regular contributor to the Facebook group ‘You’re probably from Lichfield, Staffs if …,’ had uncovered a dolphin mosaic under rotting floorboards while carrying out work there in the 1970s. More recently, Burtons, who had opened a branch on Market Street since the 1930s, Burtons moved to this prominent corner site the late 1980s. But Burtons shut up shop in March 2013, and the premises were left empty for some time. For a short time, it was the premises of Snap, but more recently WhiteStuff has moved in here, occupying a highly visible retail location in the heart of the cathedral city. Thomas Cook, the travel agents, also have part of the Bore Street frontage. Looking up one sunny morning last month, I wondered whether part of Father Kirk’s former chapel had survived on the first floor through all the rebuildings and renovations over the past 200 years. ‘Lichfield: Roman Catholicism and Protestant nonconformity,’ in A History of the County of Stafford: Volume 14, Lichfield, ed MW Greenslade (London, 1990), pp 155-159. British History Online http://www.british-history.ac.uk/vch/staffs/vol14/pp155-159 [accessed 17 February 2018]. ‘Burntwood: Manors, local government and public services,’ in A History of the County of Stafford: Volume 14, Lichfield, ed MW Greenslade (London, 1990), pp 205-220. British History Online http://www.british-history.ac.uk/vch/staffs/vol14/pp205-220 [accessed 17 February 2018]. MR Greenslade, Catholic Staffordshire 1500-1850 (Leominster: Gracewing, 2006). Kate Gomez, ‘Co-operation,’ Lichfield Lore, 11 May 2013. John Shaw, The Old Pubs of Lichfield (Lichfield: George Lane Publishing, 2007 ed). The idea for this series of morning Lenten meditations came from reading about Peter Walker’s new exhibition, ‘Imagining the Crucifixion,’ inspired by the Stations of the Cross, which opened in Lichfield Cathedral earlier this week on Ash Wednesday [14 February 2018], and continues throughout Lent. In my meditations, I am drawing on a portion of the Stabat Mater, the 12th century hymn of the Crucifixion (‘At the cross her station keeping’) attributed to the Franciscan poet Jacopone da Todi. Some of the prayers are traditional, some are from the Book of Common Prayer, and other meditations and prayers are by Canon Frank Logue and the Revd Victoria Logue of the Episcopal Diocese of Georgia. He uses blue to give a background dimension that works almost like a shadow in itself, impelling the foreground figures into greater relief. The 24-carat gold leaf haloes establish not only the central image of Christ and also those of his mother or disciples. In this station, Christ is taking the cross on his shoulders. Saint John’s Gospel alone says that Christ carried the cross by himself (John 19: 17); the other three Gospels say Simon of Cyrene was compelled to carry the cross behind him. Facing Christ as he sets out on the Via Dolorosa are a man and woman – they are without haloes, and so are representative of all men and women, all humanity. Behind him are three figures, but one has a halo, representing Saint John the Evangelist, the Beloved Disciple, who is said to have followed the condemned Christ to Calvary, and who is with the women at the foot of the Cross (see John 19: 25). The inscription in terracotta capital letters below the panel reads: ‘For in his Cross is Salvation and Life’. Tomorrow: Station 3: Jesus falls for the first time.